Bottom Line: This study found that from 2014 to 2017 in England, overall e-cigarette use was more prevalent among smokers from higher compared with lower socioeconomic (SES) groups, but that this difference attenuated over time. E-cigarette use specifically during a quit attempt was similar across SES groups throughout the period. Among long-term ex-smokers, e-cigarette use was consistently more likely among lower SES groups, and use increased across all groups since 2014. Considering that e-cigarettes are the most common type of support used in a smoking quit attempt, they offer a potentially useful tool to reduce smoking prevalence across the social spectrum. However, as with numerous other tobacco control interventions there remains the possibility that they widen inequalities in smoking due to greater adoption of the technology among ‘early adopters’ from more affluent socioeconomic groups who may then achieve higher rates of smoking cessation. From 2014 to 2017 in England, e-cigarette use was more prevalent among adults from lower compared with higher social grades. 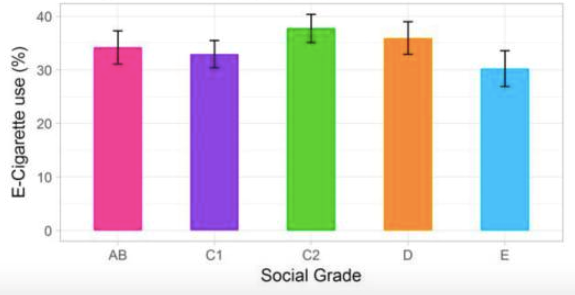 This gradient reflects substantially higher rates of smoking among lower social grades, and the higher prevalence of e-cigarette use among smokers. The use of e-cigarettes by long-term ex-smokers increased over time among all groups and was consistently more common in lower social grades. Recent U.S. National Health Interview Survey data suggested that more educated smokers were more likely to transition to exclusive e-cigarette use than less educated smokers. In addition, data from the Population Assessment of Tobacco and Health (PATH) study suggested that exclusive e-cigarette use was more likely among higher-income smokers. Conversely, this current paper found that long term ex-smokers from socioeconomically disadvantaged groups were more likely to use e-cigarettes compared with more affluent groups. This difference may be influenced by the more favorable health policy and advocacy environment towards e-cigarettes in England compared with the U.S. Among past-year smokers, lower SES groups had lower overall odds of e-cigarette use compared with the highest SES group. These differences in e-cigarette use reduced over time. The use of e-cigarettes during a quit attempt showed no clear temporal or socio-economic patterns. Among long-term ex-smokers, use of e-cigarettes increased from 2014-2017 among all groups and use was more likely in lower SES groups. E-cigarette use specifically during a quit attempt was similar across socio-economic groups. Overall e-cigarette use was more prevalent among smokers from higher compared with lower socio-economic groups, but that this difference attenuated over time.